When camping, hiking, or enjoying other outdoor activities you can find yourself in unexpected circumstances. The more you know about how to stay warm and what you may eat can help you maintain until help arrives. 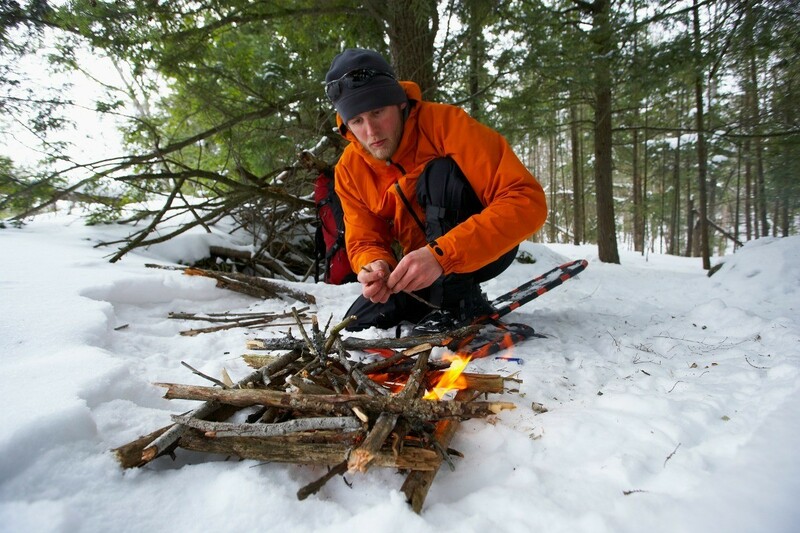 This is a guide about wilderness survival tips. 1. Knead the toilet paper roll in your hands to loosen the inner cardboard core. Remove the core,compress the roll and place inside the coffee can. I used a small roll of TP and put it in a 13 ounce metal coffee can. 2. Pour one bottle of rubbing alcohol into the can, let it soak in and -carefully-light the top of the paper. It should burn with a clean flame. 3. Set the can in an area free of flammable materials. The heater will produce deadly CO2 so crack the windows on both sides to provide ventilation. Fuel is running low when the edges of the toilet paper starts to brown. Blow out the flame. Add another bottle and relight. Each bottle will provide flame with intermittent use for 18 to 24 hours. Now get your winter survival kit stashed in the trunk of your car along with the TP heater. This tip came from a friend, a woodsman and war reenactor. Works amazingly well, but takes some prep. You should prepare this fire starter kit before you have to rely upon it off the beaten track. You may also want to keep the kit in a waterproof pouch or ziplock baggie when backpacking, just in case. Take an Altoids tin and punch a small hole into the side of the lower half with a small screwdriver or awl. The hole shouldn't be more than a couple millimeters across, less than an 8th of an inch. Cut strips of cloth, such as denim, about 2 inches long and an inch wide, layer them into the tin and close it. Do not use synthetic material; organic, vegetable fibre cloth only! Cotton does the job well, and light denim is perfect for the job. Build a medium-small fire around the box and light it. Let the fire burn down to coal with the box sitting in the coals until the fire is completely out. Recover the box. Inside should be the cloth, but it will now be completely black, looking like charcoal. This is called "charcloth." In the same fire, burn your belt buckle to demagnetize it. The trick will not work with a regular, even slightly magnetized hunk of steel. Set up a kindling fire with plenty of dry starter material in the center. Remember to allow your fire to have plenty of air flow from the non-windy side. Using your small flint stone and the demagnetized belt buckle, wrap the cloth around the flint and strike through it with the steel. In a few strikes, a spark will catch in the cloth. You will see a small grey dot appear when it does. This is an ember. Swiftly take the cloth off the flint and loosely wrap some frayed jute or dry bark shavings around it. Blow softly. Your starter material should catch fire swiftly. Place it into your kindling and away you go. When doing this step, make sure you are close to your kindling, since your starter material will burn quickly. You may want to practice this technique before having to rely on it. It takes some setup, but all your tools can fit into the Altoids tin and travel with you as a "frontier" fire starter kit. Your old lighters can be used to strike up a fire. Hold the lighter upside down atop your bed of starter material (frayed jute or wood shavings work well). Roll the flint several times (about 20), without sparking it. Magnesium will flake off the mechanism. Use the flint to spark into the spot you've just rolled the flint over. The magnesium should fire in a few tries. Make sure the spark is close enough to your flakes. If wild animals are around, for sure, you can also toss your lighter into the fire and stand back several feet. Your lighter will explode from the pressurized gas left inside. Mind you, if you do this, you'll lose your flint to the fire! But it may work to spook the animals away for a time. Source: My friend, Forrest Wilson, woodsman and carpenter. Cobwebs contain many disinfectants, including penicillin. If you're in the wilderness and someone (or yourself) has been cut badly, wrap clean cobwebs around the wound and cover with a clean cloth. Question: Can You Eat Celandine Tubers?